I’ve also been playing Blade&Soul from time to time, although my enthusiasm for Elder Scrolls Online got in the way of playing it extensively. So far, i’ve gotten up to level 10 and i have to say that it meets my expectations so far. Starting with the Force Master, i made my way out of Bamboo Village and am in Everdusk, at the moment- my impressions in that early stage. 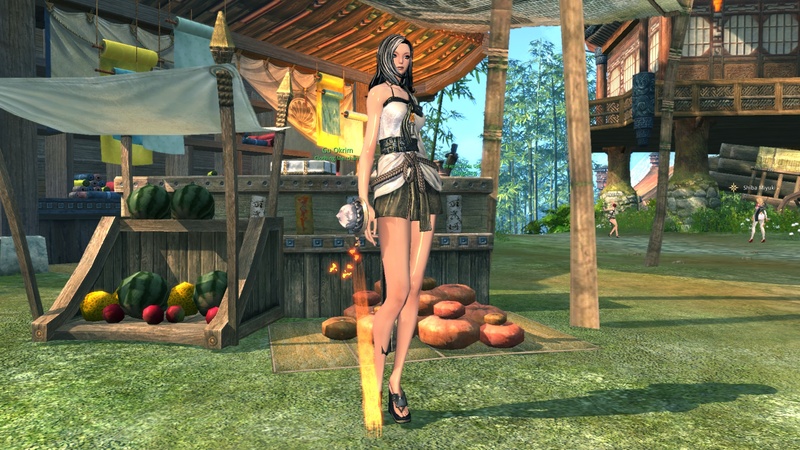 I like the art style of Blade&Soul- it’s stylized but beautiful. Areas as well as characters look nice and interesting. Although i have to say it changed from being asian-looking with a bit of a fantasy touch to fantasy with a bit of asian touch quite fast- i hope we’ll return to greener pastures soon, Everdusk is just as the name suggests. The combat in Blade&Soul is fun- i can only imagine it getting better in higher levels and/or a different class. I feel like, as with Tera, if you’re going for a caster class, the feel of gameplay isn’t hugely different to what we’re used to. Still, even the Force Master makes use of combos, and i do have a Blade Master waiting and a Destroyer planned. While i’d like to add a Summoner or Blade Dancer to my stable of characters, i won’t play Lyn. One thing keeping me at bay right now is the possibility that i might end up playing the same quests again with a new class. This year, i’d like to see some mid-level zones in the games i’m playing, so creating new characters and embark on exactly the same voyage is not what i’m after these days. But it could be a good idea to get those other two classes up to level 10 (it doesn’t take long) and see which one is connecting with me. While the maps are beautiful, the experience is mostly quest-hub-to-quest-hub. Up until now, there hasn’t been a lot of exploration to do- you’ll visit every inch of the map anyway. That might change later on. It’s also one of these games that give out a trillion quests in a hub- you go out and do them dutifully – one stack of quests will lead you to roughly the same area- and turn them in when going back. What this does, of course, is taking the meaning out of individual quests, leading to strange stories and killing some of my desire to read quest-text outside of the main storyline. 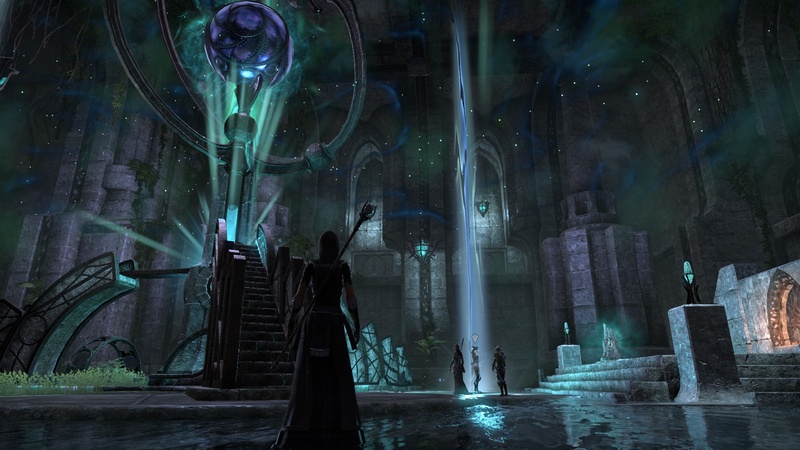 I guess Elder Scrolls Online is at fault here, because right now, i really love doing quests over there and experience them as completely as possible by following the dialogue and reading found letters, as well. Leveling is really fast right now- usually, i get a level from one stack of quests. Levelling from 1 to 5 actually took longer than levels 6 to 10, probably because of that introductory sequence and because it took me some time to get used to the pacing of the game. There are a few systems at work in Blade and Soul where i’ll have to inform myself on external sources. As far as i know, you’ll keep the weapon you get at level 5 or something up to the current maxlevel (45, i think)- you can and should upgrade it. There was a quest introducing that concept, but i still have to take a look at how that actually works. You can let your weapon take a look of another one if you want to change appearance. Speaking of appearance- right now i’m not sure of ways on getting new clothes for my wardrobe- i only have my starting gear and two outfits, probably from pre-ordering and the tier of founder pack i bought. I have some bag expansion stuff in my inventory but i don’t know how to turn them into actual inventory space (update: it’s so easy- simply click on those “rocks” to unlock inventory one row at a time) and i’m still figuring out what the soul shield is. The soul shield is…well, an octagon of splinters you can equip. There are sets that give different bonuses to stats like critical chance, agility and stuff like that. There are set bonuses if you use 3,5 or 8 pieces of the same type. There is crafting, of course, but i haven’t seen a profession teacher yet. Maybe there’ll be one in the first city? Monetization seems fine to me; maybe prizes are a bit off (15€ for a costume), but there doesn’t seem to be something fishy in the marketplace. One thing that bothers me, though, is that you can only use the wardrobe as a subscriber. That’s…strange, to say the least. On the one hand, this feature might not be enough to subscribe for it, but on the other hand it might be enough to discontinue playing the game when the feature isn’t available anymore. All in all, it feels strange to me- but i have to say that this is almost always the case for me in asian/korean MMORPGs: i have all this stuff in my inventory and don’t have any idea what it is used for- i have had similar experiences in Aion and Tera. My guess is that for people who are more familiar with those MMORPGs, everything will feel quite intuitive- Blade and Soul seems to be of a high design quality- nothing really “feels strange”, it’s just those systems that aren’t familiar to me. And finally- i don’t know why it’s always NC’s games- but gold seller spam is huge in Blade&Soul, as well. I haven’t found an easy way to block those other than typing the name into the blacklist, so general chat is mostly useless, even on a german server! I know it’ll calm down- it does so every time, but it’s interesting to see in such an amount that i last saw in…well, Aion. But i’ll take it as practice for Black Desert Online, to which i’m looking forward more and more, thanks to a few articles by Ironweakness about the pro’s and cons, choosing a class and end game in Black Desert Online. I’m going to ditch Final Fantasy 14 for now, i really don’t have enough time for it to justify a subscription- i’m totally happy with Elder Scrolls Online and i’m having fun with dabbling in Blade&Soul, Rocket League and Diablo 3. I tried Heroes of the storm for an hour or two (to embrace pvp), but it might be that MOBAs just aren’t my genre. And if want something calmer, i can either pace ESO down or simply play a singleplayer RPG. True 🙂 I’ve read your post on that topic…concentrate on a few MMOs, dabble in some more and switch to singleplayer from time to time. BTW Whitestar was also on my radar from time to time- i think i skipped them because they’re US only?